Attempted (good try!) on June 7, 2008. Here is a quick summary of the peaks climbed during this T8 trip. From Tromsø, drive E-8 about 24 kilometer to Fagernes, take Hwy-91 left there, following signs for Breivikeidet. After another 24 kilometer you arrive at Breivikeidet where the ferry will take you across the Ullsfjorden to a tiny place called Svensby. Check the ferry schedule beforehand. The ferry cost (2008) Drive about 5.5 kilometer from Svensby towards Lyngseidet (that is right when you exit the ferry). You should now be near another tiny place called Bensnes (on the M711 map). Locate a small forest road that goes gently uphill to your left (north). This road is closed by a gate after only a short distance, but there is parking for several cars on the left hand side just before this gate. This is the trailhead, location N69:37.221, E019:51.559, elevation 33 meter. To the hut: The best place from where to stage an assault on Trollvasstinden is the very nice hut called Trollhytta. This is a private hut belonging to the local community. It is frequently visited in April, a prime time to make nice ski trips in the area. At other times, this excellent hut is often without visitors. From the trailhead, follow the forest road, initially through the forest, then more left and up a pretty long hill. On the top, the road turns right (other smaller roads go left and straight). Continue more flat until the forest road ends and only tractor/ATV tracks continue. You are now at location N69:38.631, E019:53.284. From there continue on a very visible trail (slightly left) as it climbs uphill to a small ridge in the otherwise relatively flat area. You will see several wooden signs for Trollhytta along this path. Continue in a mostly northernly direction as the terrain now gently slopes downhill. 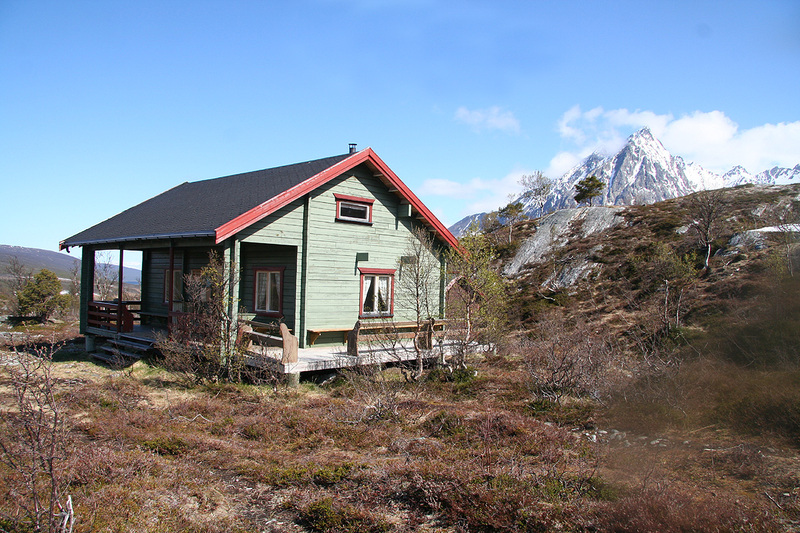 You should now see the hut as it is located near a small col between two minor hilltops overlooking the small lake Fiskevatnet (104m). One can cross a large meadow and head directly towards the cabin or one may follow the trail that contours around this meadow (on the right side) before crossing back to the location of the hut. This hut is located at N69:39.251, E019:53.210, elevation 120 meter. 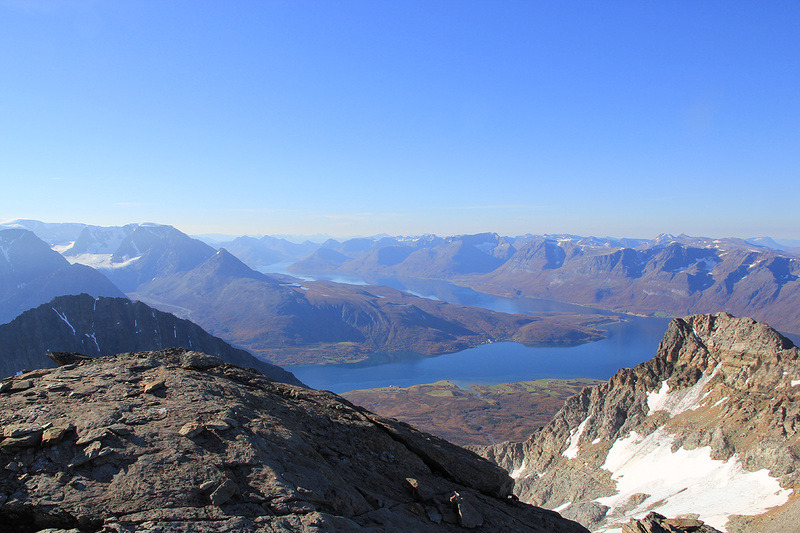 The climb: From Trollhytta, one should hike east, then north of lake Trollvatnet (92m). The best route is to descend to the meadow on the north side of the hut, cross the meadow and ascend the small ridge that runs north along the west side of lake Trollvatnet. There is a nice trail on this ridge that will get you to the north end of the lake. 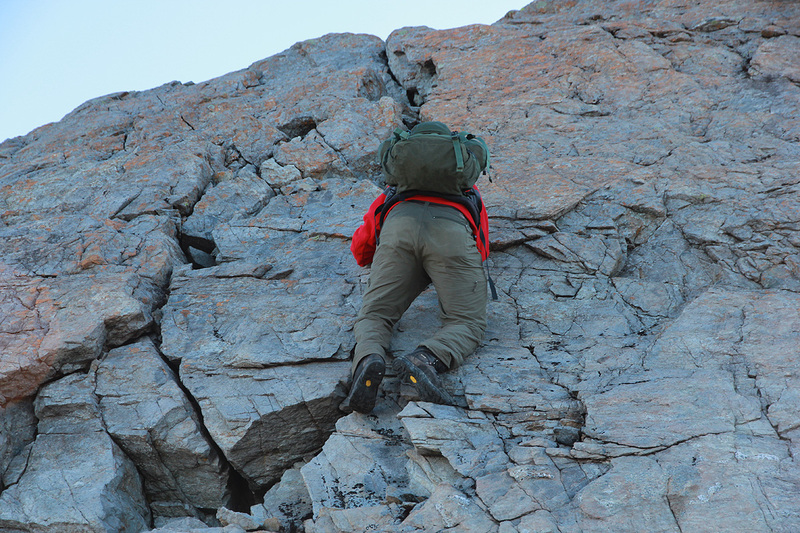 The east side of Trollvatnet has slopes with difficult boulder terrain, do not go there! 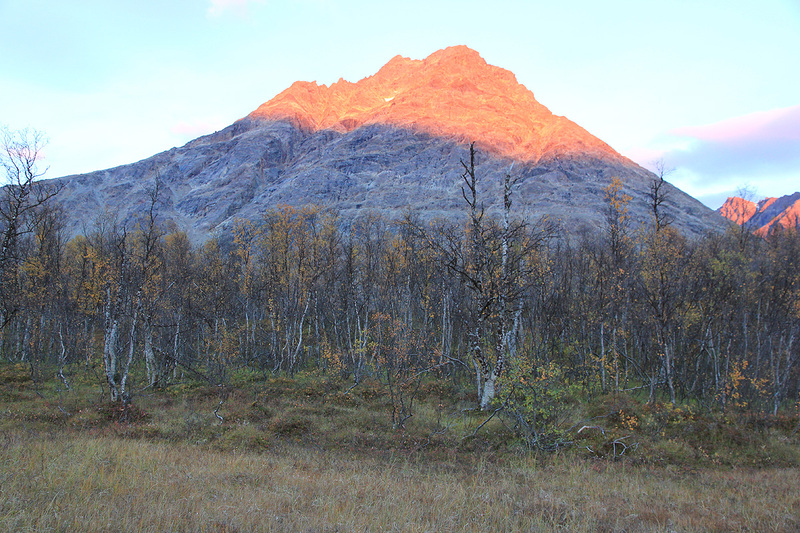 Turning more east, continue through easy birch forest until you gain the north facing flank that is located just west of the large, distinct gully that starts from the col on the west side of the Trollvasstinden summit. The best route is to climb the slope while traversing left (north), then gradually turning more right as you get higher, a broad ridge can then be followed. There is a crater like depression to your right, thus "cutting across" is not such a good idea. Ascend this flank or broad ridge until about 650 meter of elevation. You should angle into the gully just below the cliffs. This is a huge gully, you are already more than 400 meter above the bottom, yet there is almost 600 meter vertical from this point and to the col where the gully tops out. Climb the gully, possibly mostly near its right side. Be aware of and evaluate any possible avalanche danger. In the spring, one may have avalanches coming down into this gully from the steeper mountain slopes on the sides. 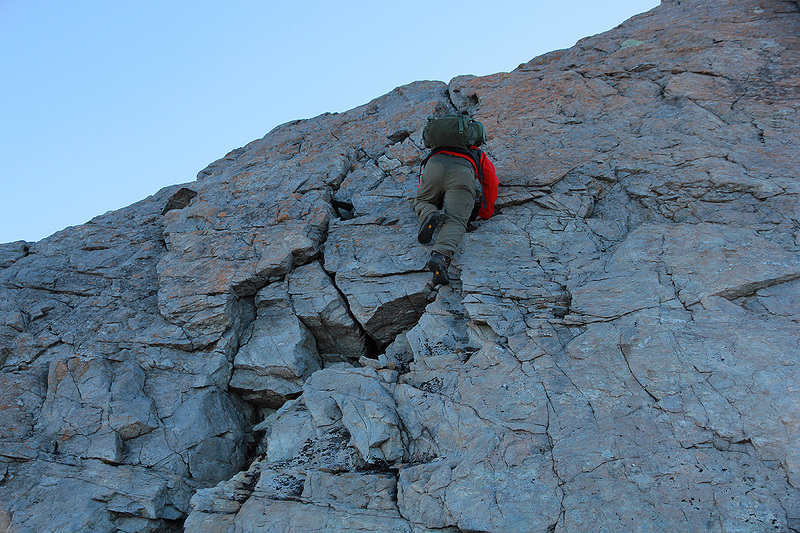 The gully is initially not too steep, but it does get steeper as you ascend higher. The top part may be somewhat more than 40 degrees steep. Exit the gully on its right (west) side at a point which is slightly higher than the saddle. 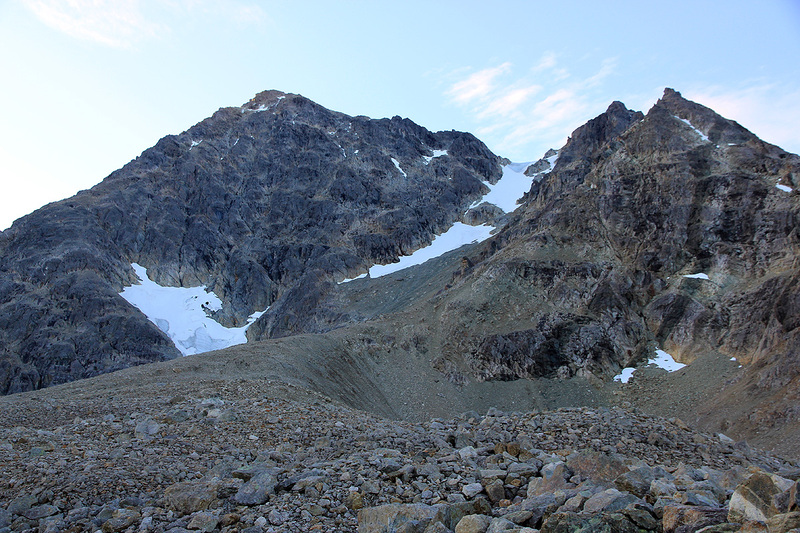 The left side of the col may have a steeper, corniced section at its very top in winter and spring, later in the fall it may turn into blue ice, this is avoided by going more to the right side near the top. 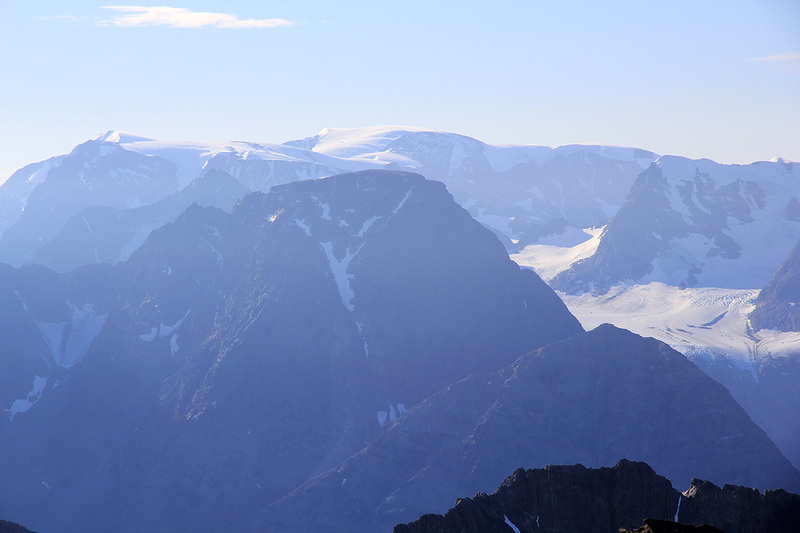 The terrain on the south side of the col is not steep and one can easily traverse back to the west ridge of Trollvasstinden. Do not ascend this ridge immediately, as it may get tricky higher up. 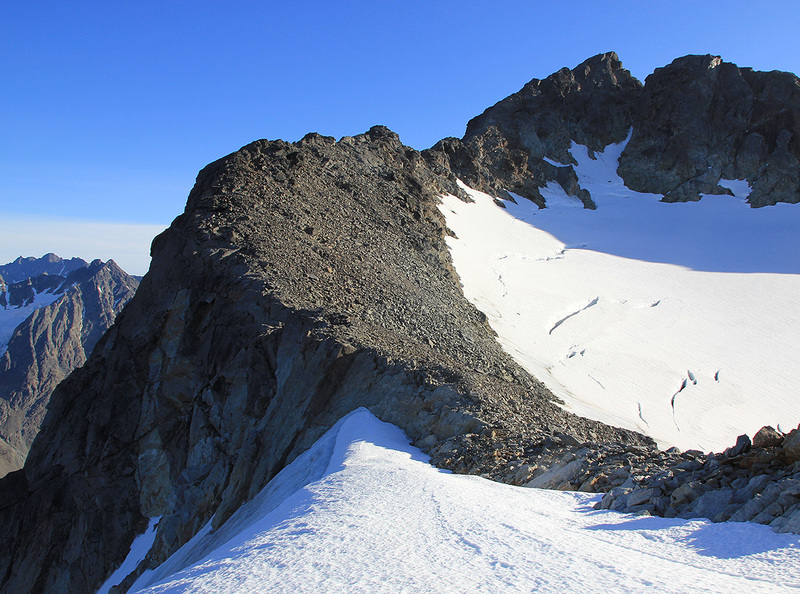 Instead, proceed along the south side of this ridge, climbing more gently and ascend more steeply to your left up a small gully (may have snow part way up), this is location N69:38.882, E019:57.850, elevation about 1290 meter. Gain the ridge here and continue higher. 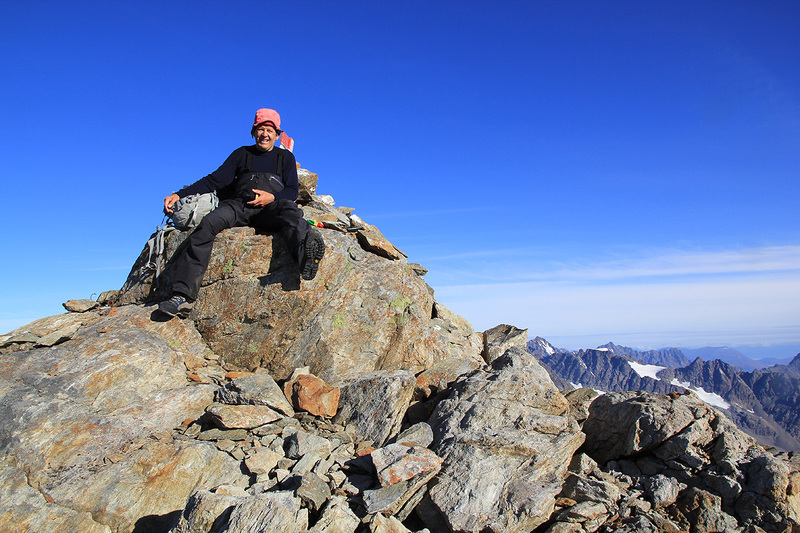 This ridge is not very narrow, however, it is fairly steep with (short) sections that require easy climbing. The conditions are likely to vary quite a bit depending on the season, the snow quality and whether there is ice on the rocks or not. 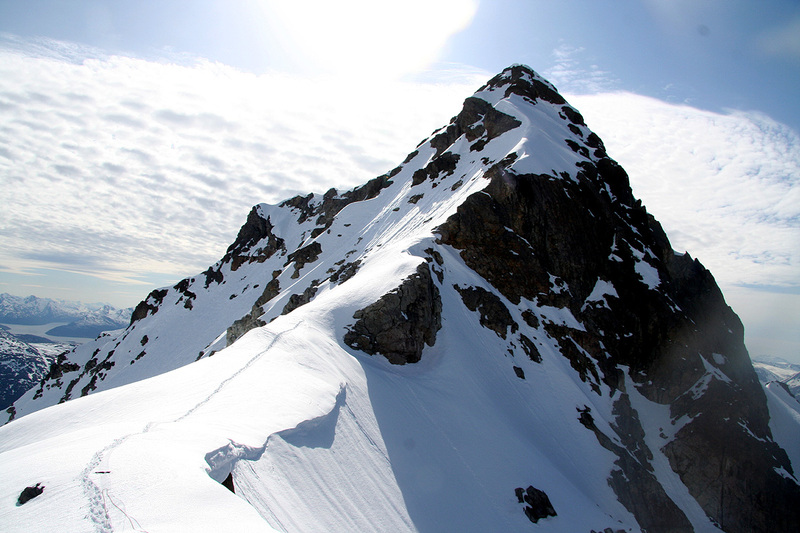 Higher up, as you approach 1400 meter of elevation, the ridge becomes a complete snow ridge, at least in early June. Evaluate the conditions before proceeding. We experienced completely rotten snow on top of a layer of solid ice. Overall, the conditions were bad enough to make us turn back. More stable snow (earlier in the season?) or less snow (later in the season) would most likely contribute to a more predictable ridge that may be used to complete the ascent. With good (warm) weather the ridge becomes free of ice and snow. The rock is good, there are cracks and the climbing is great fun. 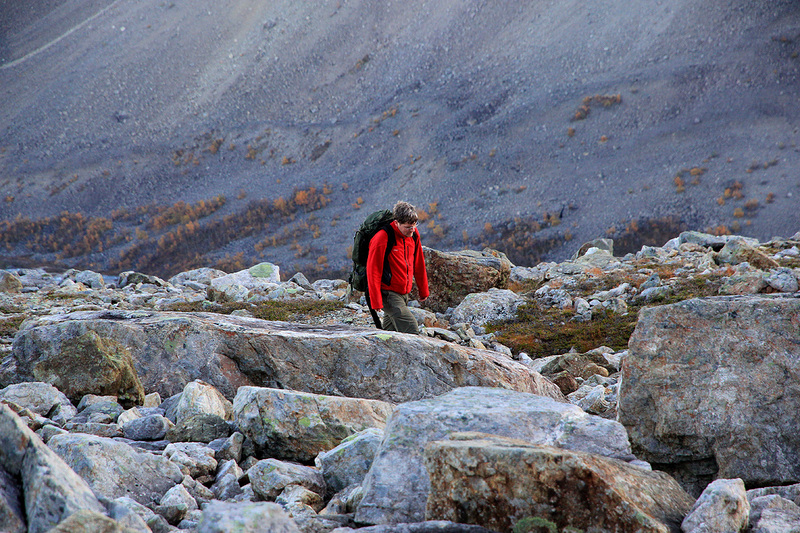 One can stay directly on the top ridge, but briefly moving off on the left side (when facing uphill), when you hit (slightly) more difficult terrain, is sometimes possible. Note:It should be noted that this climb changes considerably with the seasons. 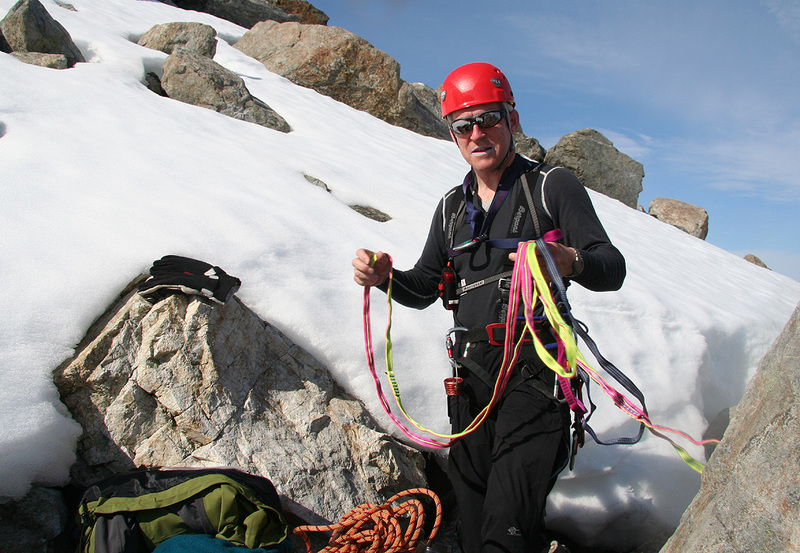 In winter, there may be dangerous avalanche conditions. 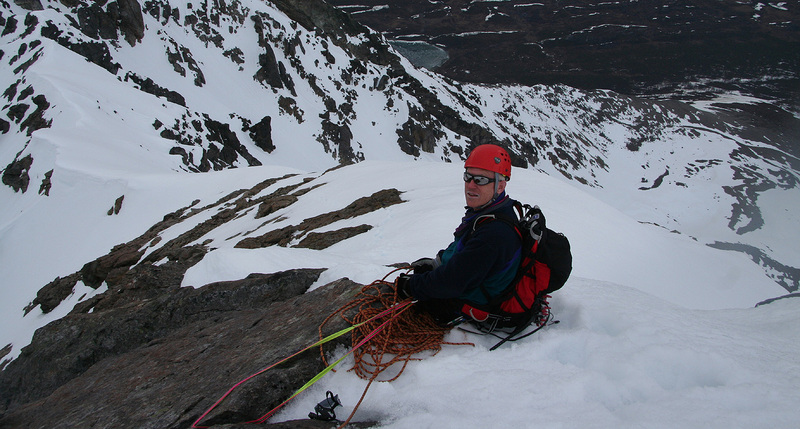 With stable spring snow, the ascent up the slope may have ideal conditions and the route will be (YDS) class 3. 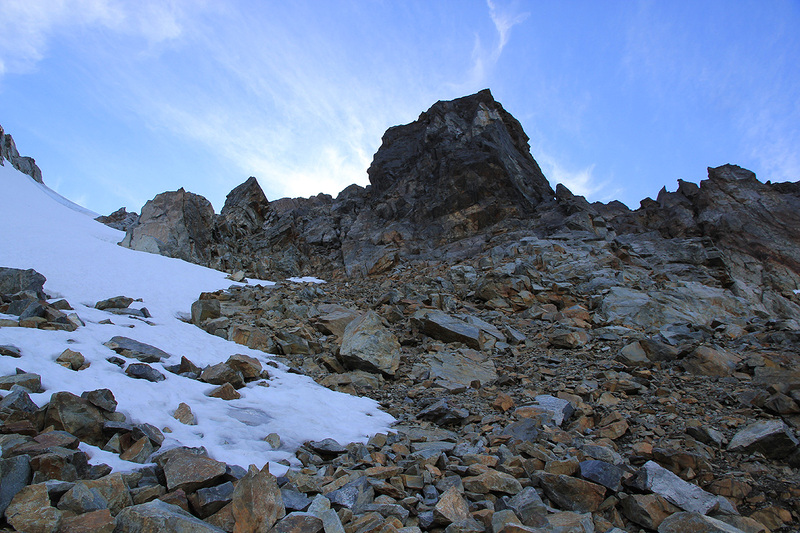 In early June, I experienced very bad snow, too soft in the gully and then an iced up rock surface higher up. In mid-summer, (when the snow has consolidated more) the conditions may again be good, with the final rock climb free of ice and snow. 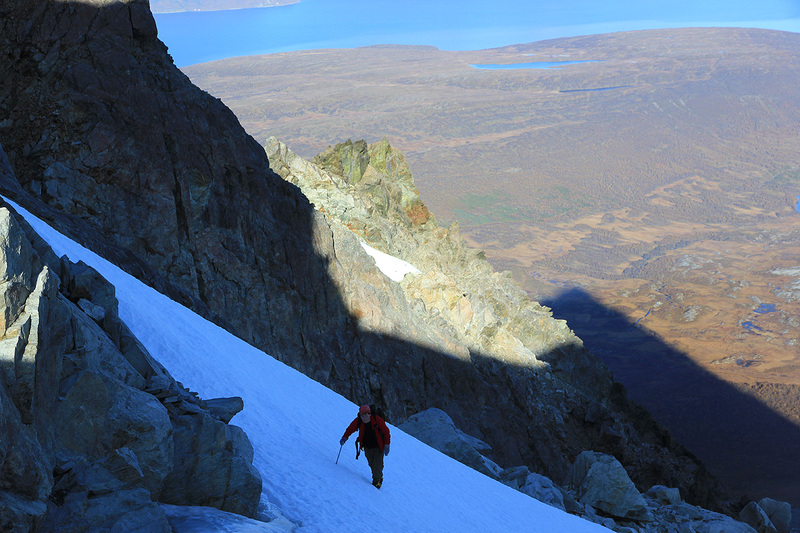 In mid September, we hit a few nice days with dry rock, however, the snow slope was now transformed to a very hard surface, almost ice and the ascent of the snow slope was again more difficult. My assessment is that under "average conditions" this climb should be rated (YDS) class 4, however, with ideal conditions it would be class 3. Such very good conditions are likely to be limited to a few days in the spring and a few days in summer only. First (epic) Attempt:I did this trip with Bjørn Hafskjold, a professor friend from NTNU in Trondheim. We arrived at Trollhytta the day before after a nice hike from the trailhead. 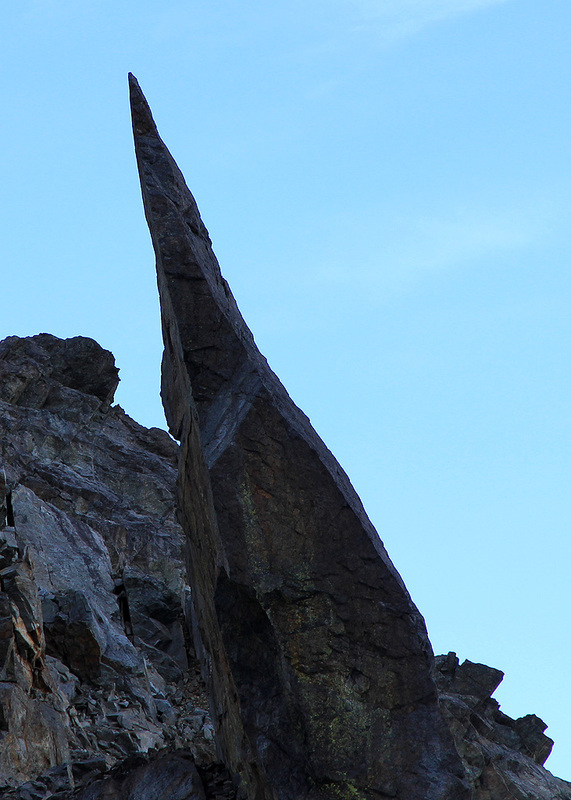 This time, we brought a complete set of climbing gear as I knew that this mountain might pose a few challenges. We started from Trollhytta at 0515. We had decided to go south and east of lake Trollvatnet, the first mistake what regards our route. We almost immediately ran into big fields of pretty large boulders. Yes, one may cross such terrain, but it takes more time than what is pleasant. Thus, the time was already 9 when we at 600 meter could enter the big gully. Almost 4 hours to here was way more than planned. The snow in the gully was not frozen as I had hoped. Despite facing almost directly north, the snow was rotten slush. I broke trail and typically stepped in to my knees, every so often much deeper. We observed smaller avalanches from the higher terrain on our right side, that entered the gully above us. I decided to take the route quite far out towards the middle in order to reduce this risk (the terrain is far steeper than it looks in this picture). We had put on our harness and climbing helmet as we entered the gully. Higher up, we started belayed climbing, not because of the steepness, but rather as a precaution against any freak avalanche that might push a man off balance and send him downslope. It seemed rather unlikely that any big avalanches could get started, but a small, slush avalanche or a small event being released from the rocks higher up was indeed a definite possibility. In fact, as I led a length that started out around a huge boulder, we crossed a stretch where smaller ice particles came rushing down in a continuous stream. This was hard work in deep, rotten snow. 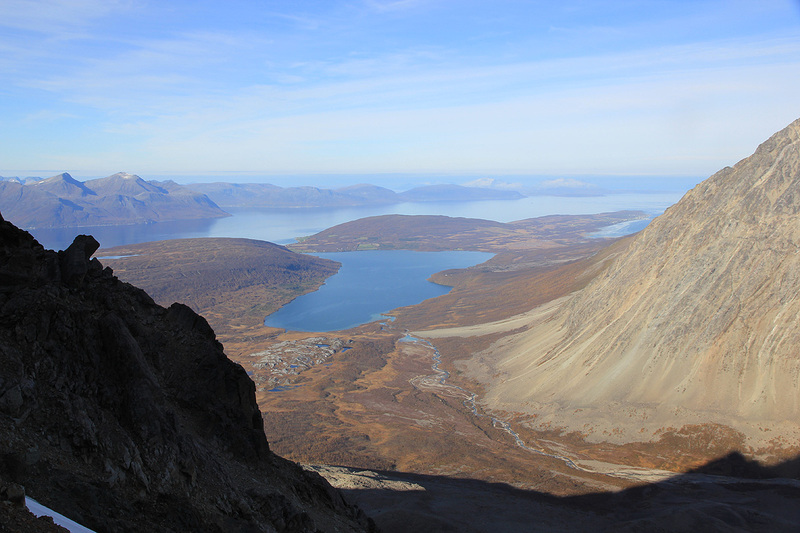 Gradually, we gained elevation and the view back north across lake Jægervatnet steadily improved. The time was 1540 when we finally topped out in the col. (Our track ascending the last stretch can be seen in the picture.) About 6:30 to climb this gully, we were both quite happy to get a change of terrain and scenery. We had reason to believe that the hardest part was now behind us, and that the rest would be somewhat easier. I started climbing the west ridge and soon found myself "cliffed out" by a steep, corniced part of the ridge descending into a local notch. Bad luck!, I shouted to Bjørn that he should turn as we then both had to descend back down to more gentle terrain on the south side of the ridge proper. Higher up, we again ascended the ridge only to discover a variation of our previous problem. Climbing up, then down this ridge was not really fun, as we were both pretty tired. Finally, on our third attempt, we made the ridge in a higher location. 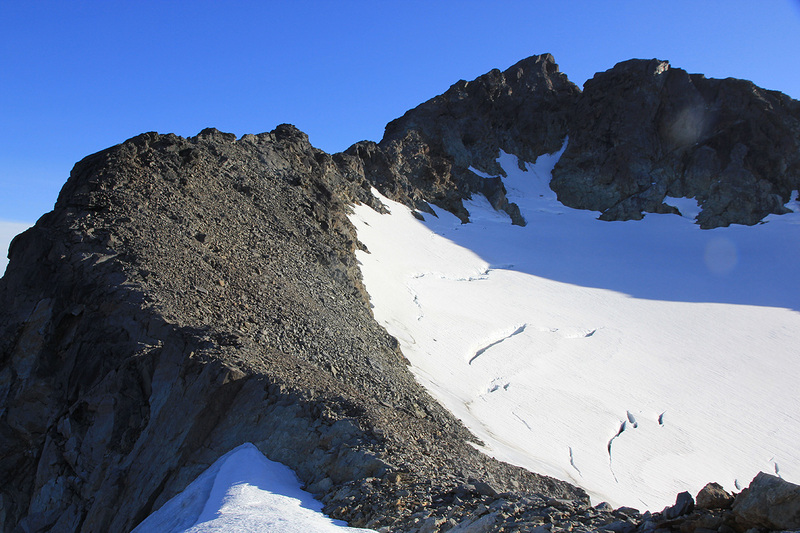 Once on the ridge, we discovered that the ridge was coated with ice underneath the rotten snow. We proceeded higher and crossed two short sections that required fairly easy climbing. 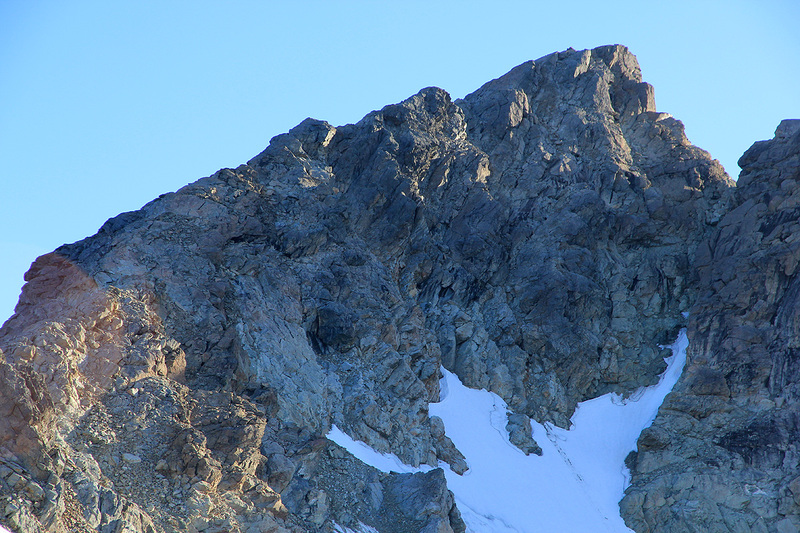 We had arrived at the highest point with visible rock, from here on the snow ridge extended to the summit. 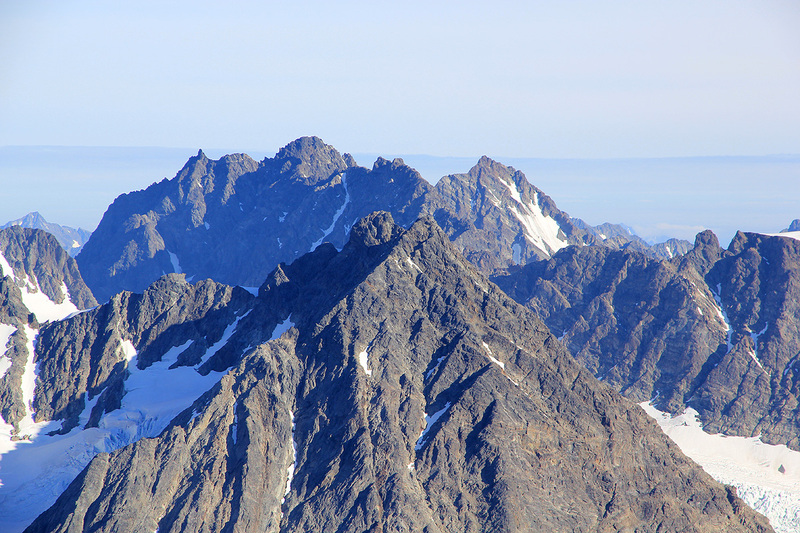 We could see across the west peak and look down at the col that we had climbed with such effort. Hamperokken that we climbed 4 years ago, pierced the sky at the horizon. Our location was N69:38.892, E019:58.079, elevation slightly higher than 1390 meter. The ridge ahead was corniced and the snow rotten. The clock showed 1900, almost 14 hours of hard work and we were now about 50 meter below the summit. A quick consultation and we made the decision that proceeding along this ridge under the prevailing conditions might compromise safety. Somewhat reluctantly, we turned around. Fourteen hours and now within 50 meter of the summit. I think this is the longest one day climb I have ever been on "on the way to the summit". The evening had cooled the snow a little. We decided to downclimb the gully without using the rope. Still, quite frequently and with absolutely no warning, we would break through one of our footsteps and sink really deep in. Care is needed since such unexpected break throughs may easily throw you off balance. We took wisdom from all lessons learned and made our return hike go on the other side of the lake. The weather kept getting better and the sun was shining brightly. We arrived back at Trollhytta after a total' trip of 18.25 hours, the time was close to midnight and the scenery was indeed very memorable. The next day we enjoyed the luxury of sleeping late. We got up around 9 and cleaned out the cabin. 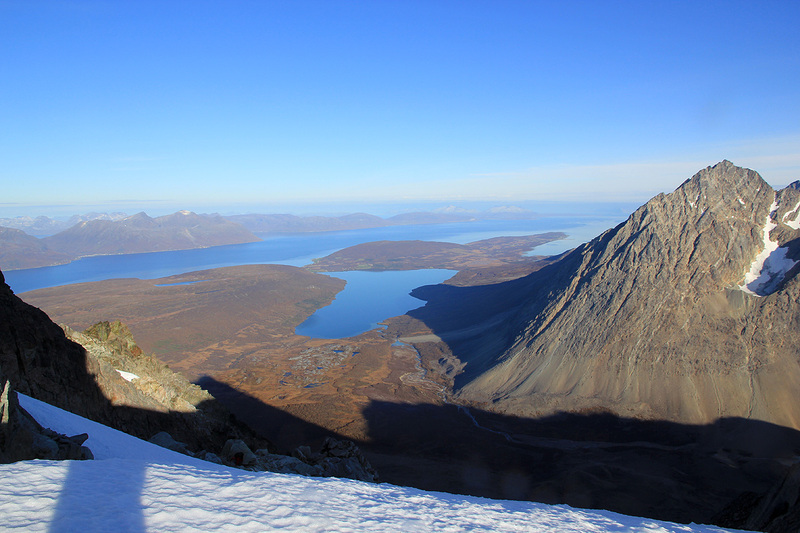 An easy hike back to the car and my spring adventure in Northern Norway was drawing to a close. Bjørn had further Tromsø business in the coming week, while I had a late departure by air back to Bergen. Second Attempt: Back again, in mid September, more than 2 years after my previous attempt. This time with my friend Geir Åke Dahlen. We decided to stay 2 nights at the nice Trollhytta and carried a good supply of food and gear after an easy drive from Tromsø. 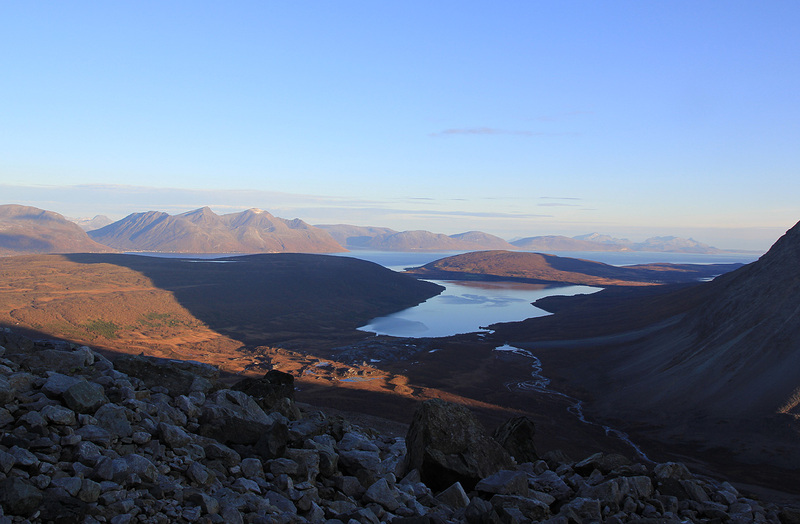 The last rays of sun was hitting Stortinden and the outlook for the next day promising. 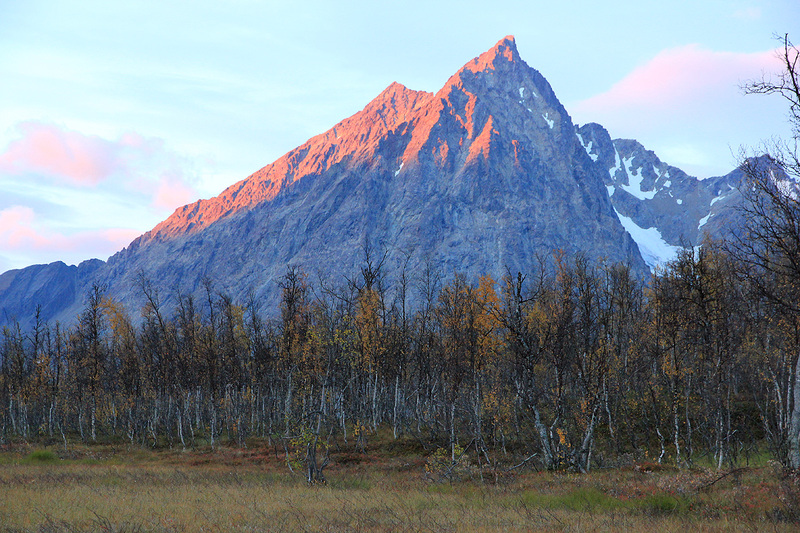 We started out at 0530, the weather looked very good and the fall colors were brilliant. The first sun was hitting the summits, but we would climb a north facing gully and therefore not see the sun until on top of the key col. it seemed ok that we were not heading that way. I knew the route from previously and we made good progress, arriving in the huge gully by 0730 after a nice morning walk with no hurry whatsoever. The gully was melted out in the lower section and the snow higher up was also broken by a cliff band that went across. Near the top, one could see that the snow had already transformed to ice. We hiked across on loose ground in order to climb as much as possible on snow. The snow turned out to be extremely hard, in fact, I could not at all get the spike end of my ice axe into the surface. Only the sharp pick would go in with a good swing. Overall, pretty good for crampons, however, any fall would be difficult to self-arrest. We proceeded up the snow and across the melted out area on the right side. Higher up, the snow got even more icy and the grade felt too steep for comfort. We traversed to a huge rock rib in the middle and climbed it (YDS class 3) to the top. 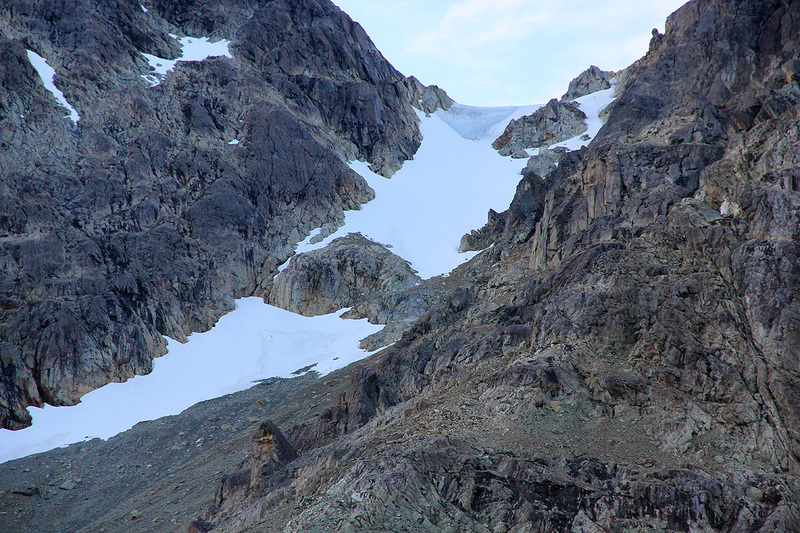 From this point, we could complete the snow climb on a somewhat nicer slope leading to the rightmost part of the col. The conditions were close to calling for protection, obviously, this would have taken much longer. We made the col by 1000, that is 4.5 hours. The weather held, gorgeous blue sky and a pretty nice little glacier below the final summit ridge. We traversed to the correct gully that connects to the main ridge without any further obstacles. The climbing on the ridge was pure fun, nice solid rock, sometimes quite good sections with smooth rock, but always with some cracks. I showed Åke where Bjørn and I had turned back 2 years ago. 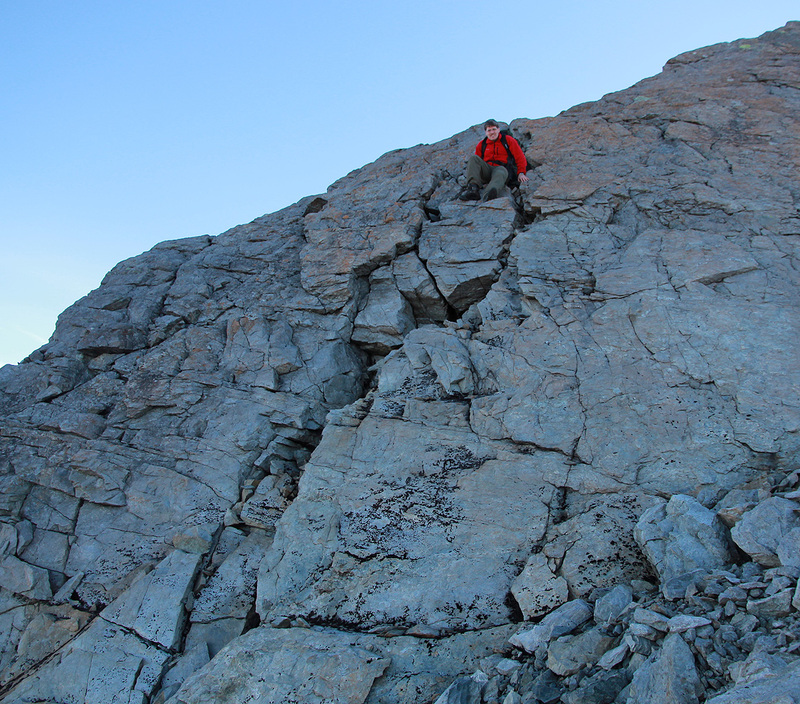 Just before a small notch where the ridge narrows and one needs to downclimb about 2 meter in fairly exposed terrain. Today, this downclimb was easy, one could also bypass this point on the left side. Higher up, we encountered a somewhat steeper wall having a very nice crack leading upwards. Finally, near the top, one may either friction climb a smooth slab (with small holds), or one can traverse a bit off the ridge to the left, then climb back up before arriving at the nice summit area. 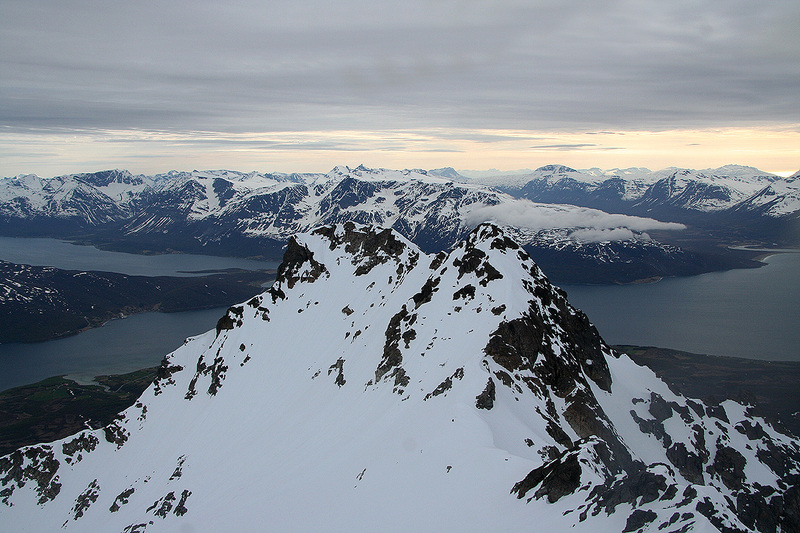 We arrived at the summit at 1055, a good place to rest and study the phenomenal views of Lyngen. 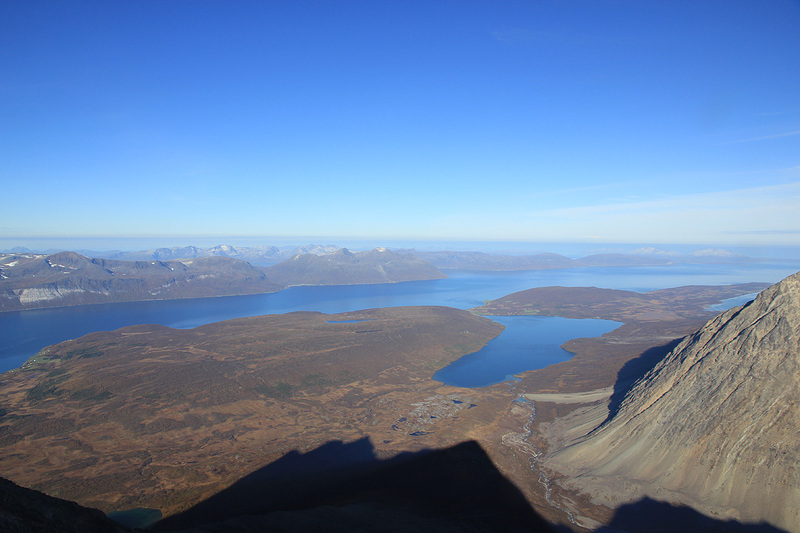 From Jiehkkevarri, 1834m, to the south to the jagged peaks around Lenangstinden, 1625m, to the north. We stayed for 40 minutes, a very good break. We had one small problem, the last time we crossed any water was all the way down by lake Trollvatnet. We had felt certain that there would be some water higher up, consequently we were getting increasingly thirsty. Descending at 1135, no problems until downclimbing the rock rib. Going first, I first stepped onto a pretty large rock, more than one meter long, then sat down on it in order to carefully get down to a lower location. As I sat, I suddenly felt that the whole rock started sliding downhill. My legs were in great danger, I quickly moved them up, trying to let the huge rock slide under me while holding onto some other rocks nearby. Fortunately, the rock stopped and the situation cleared. The rocks around here were extremely loose, we guessed that this was a direct effect of being buried under the steep snow for 10 months, pushed downslope by the weight of the snow then left to themselves and gravity as the final ice and snow would melt away sometime in early fall. Descending the upper part of the snow slope was hard work, with a need to safeguard every step by slamming the pick of the axe into the slope above. Further down, things where easier and we moved out of the loose and somewhat nasty gully to better slopes with vegetation and beautiful fall colors. With no hurry, under a warm September sun, we returned back to Trollhytta by 1630. 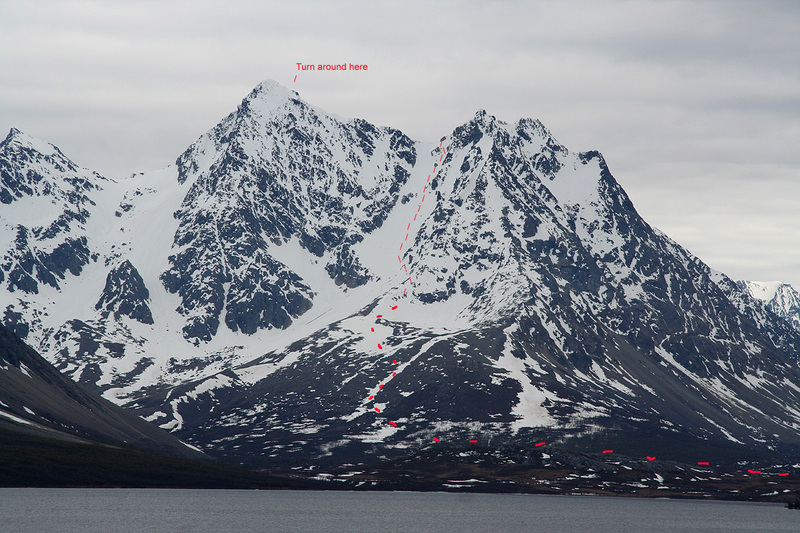 Trollvasstinden.The picture shows our route and the point where we decided to turn back. 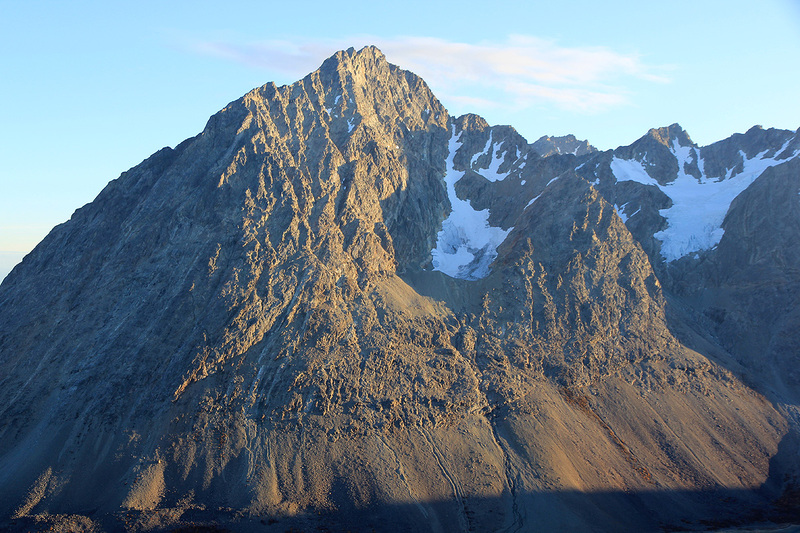 Sharp spire.This could be a challenge for people collecting peaks with only 10 meter of prominence. Panorama view south.The view is from near the col. Kveita can be seen near the middle. Panorama I.The view is from where we turned back. Panorama II.The view is from where we turned back. Jægervatnet and the fjord behind. 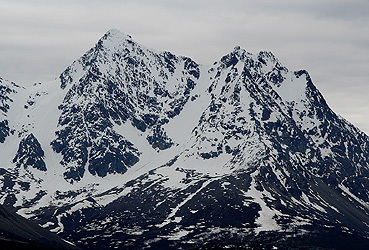 Stortinden, 1512m, as seen while climbing Trollvasstinden. 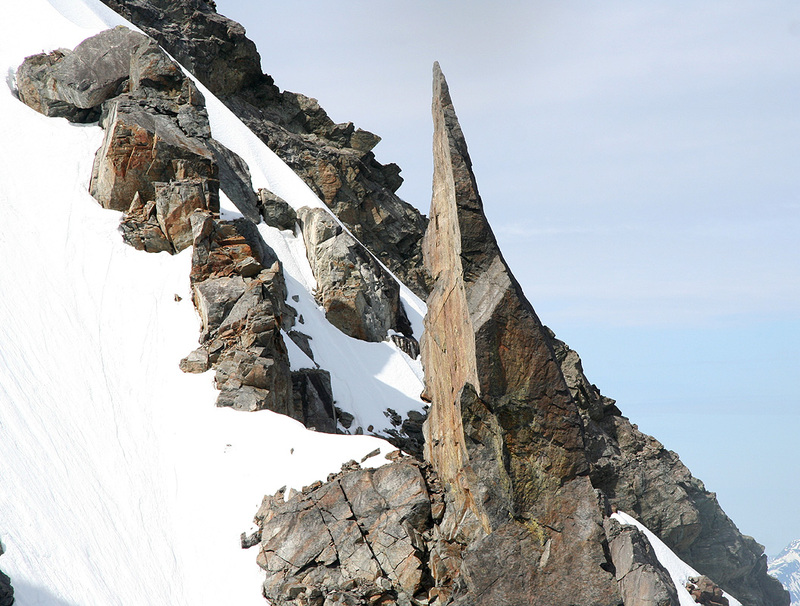 The needle, it looks like a difficult climb. 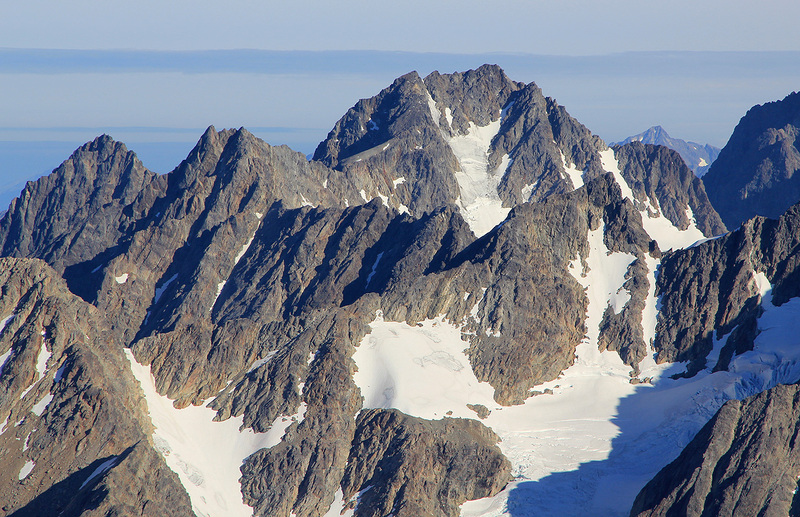 The summit ridge, upper part. Lille Isskardtind, 1338 meter, seen from the summit. 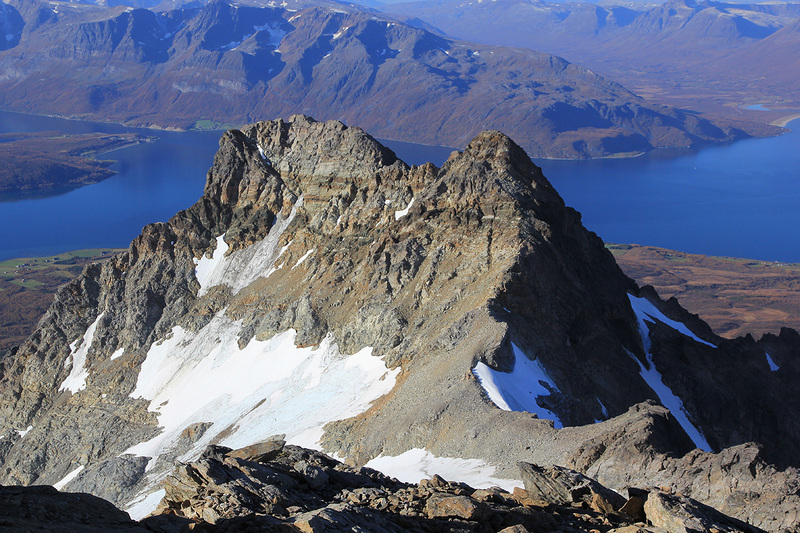 Jægervasstindan, 1543m,, seen from the summit. Panorama I, north towards east. Panorama II, east towards south. Panorama III, south towards west. Panorama IV, west towards north.